I am sorry for the delayed post. But I promise this strategy will more than make up for the delay. Like the milk which takes time to freeze and become the satisfying ice cream, this post took its time to come but would be a sweet reward for the patience you showed. OK OK !!! I am not an ice cream seller so will come back to today’s strategy. 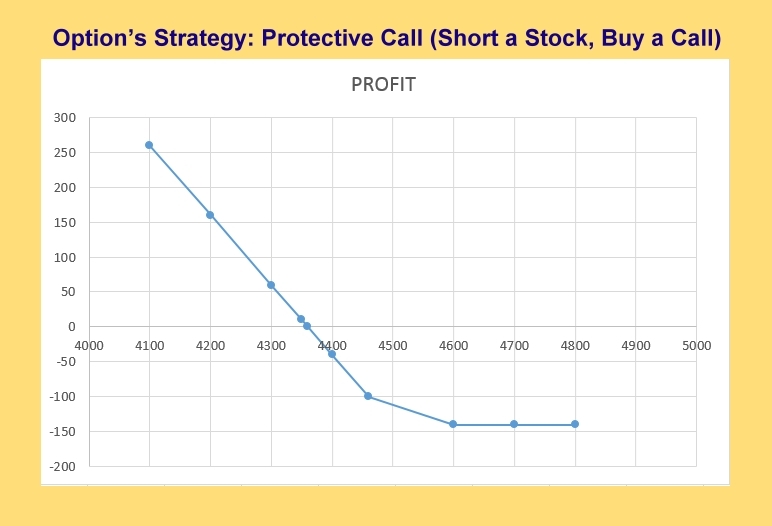 Protective Call is a very good hedging strategy using which the trader, who has an existing short position in any particular stock, can buy an ATM of slightly OTM call option of that stock to guard himself against the rise in the price of that stock. In case the price of the stock falls, we can profit from the downward fall in the price. But, in case there is an unexpected rise in the price of the stock, our loss is limited. This way, you can play both sides in this strategy. If the price of the stock falls, you will earn profits. If the price rises, you will always have the right to exercise your call. When you are bearish in the stock but want to protect yourself from the unexpected rise in the price of the stock. To protect yourself from any rise in the stock price, we short the stock of XYZ Company at Rs. 4460. The net credit that will come to us is Rs. 4360 (Rs.4460 – Rs. 100). The protective call is also known as a synthetic long put as its risk/reward profile is the same that of a long put’s. 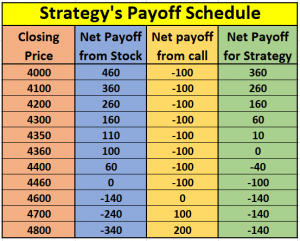 There is no limit to the maximum profit attainable using this strategy.